The domain is one of a group of gardens which lie between the Yarra River and St Kilda Road. 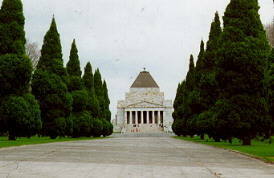 The domain contains the Shrine of Remembrance, which can be seen the length of Swanston Street. A grey stone structure on a hill, the shrine once dominated it's surroundings. Nowadays St Kilda Road, which winds around the Shrine, is lined with tall buildings containing offices, 'apartments' and shops. The Myer Music Bowl, an outdoor venue for events such as Carols by Candelight and the Eurythmics, during winter is a ice skating rink. 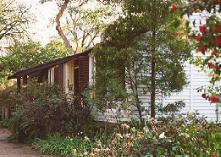 Governor La Trobe's cottage, home of Victoria's first governor is located in the Domain. 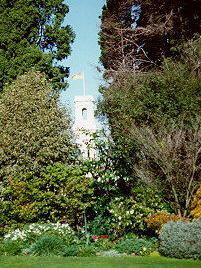 Also in the Domain is Government House, a copy of Queen Victoria's palace on England's Isle of Wight. The house is so surrounded by established trees and other plantings that only from Melbourne's tallest buildings can the surrounding lawns be seen. When a flag tops the building, the governor is in residence. 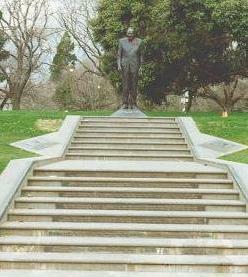 Items of interest: Sidney Myer Music Bowl, La Trobe's cottage, Shrine of Remembrance, Sir Weary Dunlop statue, Pioneer Women's Garden. For a panorama which includes these gardens, click here.